Safety pin jewelry is a fun and popular project with kids, but stacked safety pins can make an eye-catching watch band for adults too. The safety pins add shine and texture to the watch band, while stretch ribbon brings color. Stretch ribbon comes in satin, velvet and organza, which along with different beads, will change the look of a safety pin watch band from casual to elegant. Open a safety pin and thread seed beads across the open end of the pin to just before the pin end. 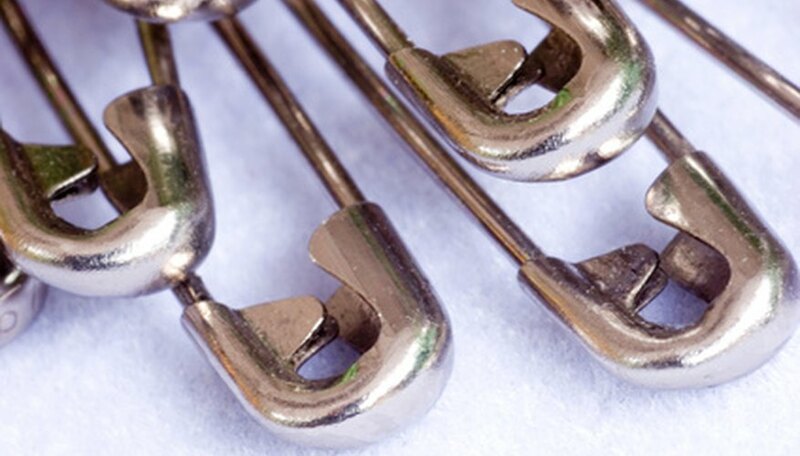 Close the safety pin and crimp the head with pliers to keep it closed. Continue threading seed beads and crimping the safety pins, one by one, until all the safety pins are done. Measure your wrist by wrapping a length of stretch ribbon around it so it is taut, but not stretched out. Cut the ribbon with scissors to the correct length plus an extra 1/2 inch. Fold both cut ends of the ribbon over 1/4 inch to make a neat edge. Apply a small amount of glue to one side of the folded ribbon end. Place the open end of the ribbon end clamp over the folded end of the ribbon and then crimp the clamp closed using nylon jaw pliers. Open a jump ring using flat-nosed pliers and place on the end of the ribbon end clamp. Attach the same jump ring to the watch face pin on one side so the ribbon is facing right side up. Close the jump ring with the flat-nosed pliers. Slide the beaded safety pins onto the stretch ribbon with the beaded sides up. Stack the beaded safety pins tight against the ribbon clamp and each other until about 1/2 inch of ribbon remains uncovered. Pin an extra safety pin through the ribbon at the end of the last stacked beaded safety pin to hold the stack tight until the ribbon end clamp is attached. Repeat Steps 6-10 to finish the remaining end of the watch band. Alternate the safety pin heads and bottoms every other pin to keep the safety pins stacked evenly. Use 1 3/4-inch safety pins and wider stretch ribbon for a bigger, chunkier look Plan the layout of the seed bead colors to make a pattern in the watch band. Use adult supervision for children beading the safety pins.